Covington and Hamilton were two cities faced with a challenge: Improve your urban landscapes, or else. That’s when inspiration struck. There’s an entire mythology built around artists and their relationship to cities. There were the OGs of ancient Athens, responsible for the sculpture, temples, and pottery that still largely define that city. We hear painters in Italy had something to do with the Renaissance. Art Nouveau is synonymous with Paris. Early in his career, Pablo Picasso was a fixture at Barcelona’s Els Quatre Gats café—had his first exhibition there and designed the menu cover—where Gaudí was also a regular. In Manhattan, the abstract expressionists congregated in Greenwich Village in the ’40s and ’50s, while Robert Rauschenberg circled his Lower East Side block collecting the detritus of the city as material for his work before heading back to his apartment/studio right above that of Jasper Johns. And let’s not forget Soho in the ’70s. The connection carries into economic development, too. In Bristol, England, where Banksy got started, a reputation for street art has become a draw for tourists and a point of pride for locals. In 1974, a conceptual artist named Raivo Puusemp ran for mayor of Rosendale, New York, won, and using tactics he’d developed as an artist, managed to save the town from fiscal crisis—a serious political feat, but one he approached as art. And up in Detroit, an arts nonprofit called the Heidelberg Project has, since 1986, turned abandoned houses into public art installations. Art consistently gravitates toward the old and disused in a valiant effort to make it new. It’s a never-ending cycle of life, death, and rebirth, all perpetuated by artists who seek out worn-down neighborhoods in search of low rents—and often historic buildings that offer some sense of authenticity and creative satisfaction—and improve them. For better or worse, more substantial development tends to follow, which is why rents in Greenwich Village are not what they used to be. So, imagine you’re a city government or nonprofit redevelopment group. You have limited funds for the not-so-limited tasks of jumpstarting an economy, repopulating a neighborhood (or several), and rehabilitating a parcel of historic properties. How do you begin? For the Center for Great Neighborhoods (CGN) in Covington and the City of Hamilton, the answer is simple: with art, and those who make it. Both entities are pursuing creative strategies—and creativity as a strategy—to wrangle this pattern of artists improving cities in an intentional way. If they succeed, the role art plays won’t be a passing phase, but will be built long-term into the identity of each place. M.L.K Jr. boulevard in Covington is big. six-lanes-across big. even so, the grand opening last September of the newly rehabbed Hellmann lumber mill—now artists’ studios, community meeting rooms, and CGN’s offices—was impossible to miss. After all, where there’s smoke, there’s fire. That day, the fire was built to roast pigs, okra, and corn dumplings—on special grills hand-forged by Fire Lab, a previous CGN grant recipient—for the kind of diverse, dynamic crowd civic organizations strive to attract and very seldom do. The beer from Braxton Brewing Company, the Gutierrez Deli tacos, and the roasting pork were clearly helpful, but the energy transcended the quest for free food. Along this most visible stretch of road in the Westside neighborhood, Hellmann, built in 1870, had been a community anchor and major employer before being shuttered in 2001. (Can’t place it? Wunderbar is across the street.) Having sat vacant for 15 years, the building was a natural place for CGN’s headquarters: It gave their mission—to create tangible, noticeable change and support artists as a means of community engagement—more visibility. The barbecue-chomping attendees were also celebrating the 40th anniversary of CGN. Founded in 1976, the organization started out in the social service realm. Two decades later, it had morphed into a community development organization, a transition spurred by safety work CGN was doing, particularly in the Westside. “In the late ’80s, early ’90s, crime got really bad,” says Tom DiBello, CGN’s executive director. “Around the late ’90s, early 2000s, the city started purchasing properties where some of the worst crime was happening and tearing things down.” That was largely in the vicinity of Orchard Park. It didn’t take long for the state to intervene; the area was part of the Lee-Holman Historic District, and its structures, including six shotgun houses across from the park, could not be torn down without a plan. As the city and state hashed things out, CGN continued redeveloping neighboring properties. By this year it will have transformed close to 40 vacant homes into desirable housing, with more on deck. But CGN’s redevelopment activity has become something more specific still: creating live-work spaces for artists. Take those once-crumbling shotgun homes near Orchard Park, a block north of M.L.K. “People thought they looked like trailers,” says Sarah Allan, CGN’s program director of creative placemaking and the main driver of its arts-driven redevelopment work. 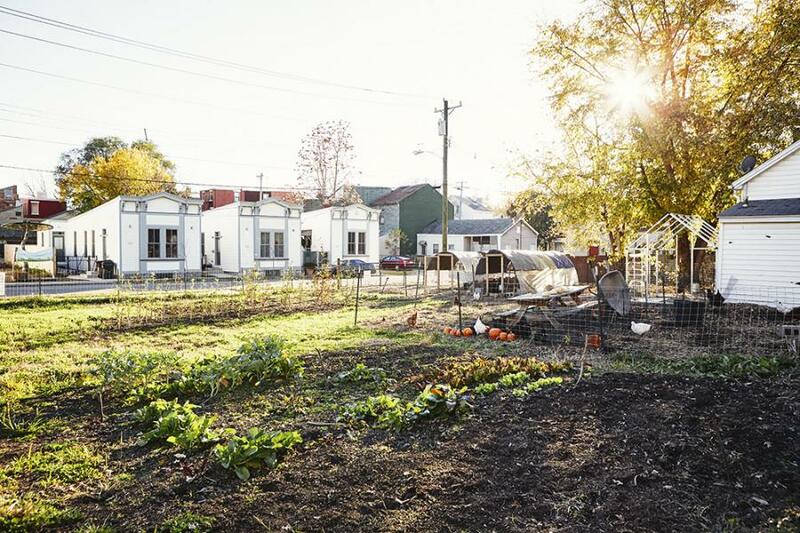 “Everyone thought: Tear them down.” But she knew about a project in Houston that provided a rough template for what CGN might do instead: turn them into live-work housing they could sell to artists. The effort—completed in 2014—was a major turning point for CGN. The Kresge Foundation signed on to fund that project; impressed with CGN’s work, a more long-term relationship was born. “We thought this was a one-off project,” says Allan. But CGN successfully applied for a multi-year creative placemaking grant that has spurred much of its work since. Because funders have picked up on the phrase, “creative placemaking” is now slapped on a whole range of projects, but for CGN it means trying new approaches to huge, long-term issues such as poverty, crime, and population loss. 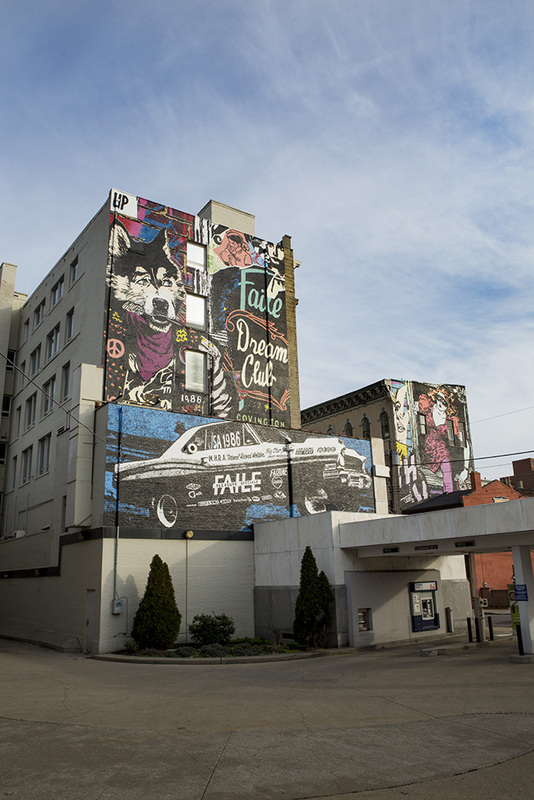 It encompasses physical developments, like murals and parks, along with more abstract elements that shape urban areas—such as fostering community dialogue and connection. The concept views “place” in terms of human experience: Keying into the meaning and memories that make an urban space, whether it is one block or an entire city, singular and special. The stronger the ties can be made, the more the community engages with, has pride in, and values the city. Creativity is a means as well as an end, and CGN upholds a broad, flexible definition of “artist” and “creativity”—chefs, architects, and sculptors are all fair game. Bringing the community into whatever task or project is at hand, and intentionally seeking out populations it hasn’t already reached, is priority number one for CGN and goes a long way in explaining how it managed to attract that grand opening crowd. It is also a mandate in all of CGN’s initiatives. The biannual Creative Community Grants—$5,000 for artists to execute a project around a certain theme (i.e., inclusion, safety, health)—show how serious CGN is about community engagement and overall benefit. It also shows how playful the organization can be. Recipients have hatched ideas to have goats control overgrowth in Goebel Park, created a Raymond Thunder-Sky memorial sculpture, even launched a podcast. One grant awarded to Anne-Marie Herrera and Ximena Flores led to a mosaic mural at the Hellmann Center. Flores and Herrera may have planned, designed, prepped, and installed their mosaic, but members of the community actually laid the tiles. And it was not a color-by-numbers situation: The artists handed participants blank pieces of mesh with the design outlined, and granted free reign with colors and shapes of tile. Herrera loves the outcome. She sees it as a way to develop community pride—I belong to this community, my hands helped make that mural—and cultivate relationships. “People who have never talked to each other are sitting at the same table sharing blue [tile],” she says. On a smaller scale, there are the Nano Grants, $250 awarded on a rolling basis, as a way to pull creativity out of people who wouldn’t necessarily define themselves as artists. “It’s not about the money, it’s more that it validates that your idea isn’t completely crazy,” says Allan. “The criteria basically is [come up with] a way to bring people creatively together.” In the less-tactile creative placemaking category, there’s the Kresge FreshLo initiative, for which CGN was one of only 26 recipients nationwide. “It’s cross-sector, looking at creative placemaking and arts with food and food access,” says Allan. Data gathering was a big first step, but even that was creative: Spray-painted tablecloths at one early event replaced e-mail surveys. After a whole lot of community input, CGN tapped Okawa Chako, a Covington resident interested in starting a restaurant, for a pilot project. They brought in the Life Learning Center, which assists “at risk” individuals as they become self-sufficient, to staff a pop-up restaurant called La Casa de Chako, which will debut on April 7 and 8. While grantees can work throughout Covington, CGN’s physical development is concentrated in the Westside. Through its Homes for Makers program, it buys homes no one else wants. Depending on the property’s condition, CGN either rehabs and sells the house or transfers it at cost and walks alongside the buyer through the rehab process. “We vet the people really well, so we know they are invested in the community and want to be here,” says Allan. By doing this work slowly, one property at a time, CGN has avoided displacing or alienating current residents. It can’t fully rehab every home, so it has also developed a Creative Facades program for homes in key locations: a $10,000 grant to improve the exterior. Covington design firm BLDG created a “lookbook” for the facade-improvers to follow, which pulls from local history to create a coherent—and meaningful—aesthetic, and CGN enlists local artists to do as much of the work as possible. One of those projects was an ArtWorks mural at East Seventh and Washington. It overlooked a vacant parking lot; using grant money, Renaissance Covington painted the lot, built a stage from pallets, put in electricity and planters, and named it Mad Lot—a new outdoor performance space. Then Red Bike put a station there, and Braxton Brewing Company opened up next door. Now, the 110-unit Duveneck Square development is under construction by NorthPointe Group, with help from the City of Covington and The Catalytic Fund. The mural and lot are gone, but they were never the final goal. “It starts with a mural and ends with a $20 million development. It’s probably the most textbook I’ve ever seen of an art intervention that transformed into economic development,” says Meyer. Thirty-five miles up I-75 from Covington, another urban facelift is taking place. Downtown Hamilton is not what it once was—in the best way possible. It still has its historic charm and building stock, but it’s now active with shops, cafés, public art, and a good deal of construction fencing sporting Coming Soon signs and renderings of big new projects. Businesses have moved their offices downtown, and new ones have opened. A vacant Art Deco municipal building is now home to craft brewery Municipal Brew Works, a TV station, and a business incubator called Hamilton Mill. The city was dubbed the “City of Sculpture” in 2000. Pyramid Hill Sculpture Park is within its borders, and more pieces are scattered throughout downtown, but murals are beginning to appear, too. StreetSpark, a competitive public art program, kicked off in 2016 with two murals—one honoring native son Robert McCloskey’s children’s books, including Make Way for Ducklings, the other honoring the city’s namesake, Alexander Hamilton—and they intend to add more this year. After years of planning, the city celebrated the grand opening of the Artspace Hamilton Lofts in September, an affordable live-work setup for artists. The 2,000-person-capacity RiversEdge Amphitheater, overlooking the Great Miami River, opened in 2013 and its success inspired the creation of Marcum Park, named for the family who donated $4.5 million to build it. The park is getting its finishing touches now, with a ribbon cutting planned for May 6. All of this was no accident. In 2011, the Hamilton City Council passed a strategic plan. One major objective: create an arts identity for the city. Leading that charge has been Bud Scharf, community development director, with the full support of City Manager Joshua Smith and an outside assist from Fitton Center Director Ian MacKenzie-Thurley. MacKenzie-Thurley is from Sydney, Australia, and he moved to Hamilton by way of London, England. One of these is not like the others, he knows. But his wife is from Hamilton, and when they came on a visit in 2013, they stayed. “We wanted to make our home here, because there was something going on here that nobody quite ever experienced before—this energy,” he says. “Not just the arts, but the city, commerce, the schools. And everybody working together.” Two years later, he became director of the Fitton Center for Creative Arts, and by all accounts is now a fixture in that energy and growth. This becomes abundantly clear on the tour he gives me of Hamilton’s newly rehabilitated urban streetscape. We swing into the Miami Valley Ballet Theatre and turn the corner around the Butler Tech School of the Arts—both housed in the former Journal-News building—before looping down a wide brick-walled alley dotted with trees and tables to High Street, downtown’s main drag. True West coffee shop, The Almond Sisters bakery, and Renaissance Fine Art Supplies are all right there, but we’re on a mission, and hang a left. As we exit Inside Out Studios—a place for artists with developmental disabilities to make and sell their work—we pause to look at a patterned, painted fire hydrant, a public art project Inside Out was responsible for. Suddenly, like something out of a Fellini film, a pair of people roll an arcade game up the sidewalk. MacKenzie-Thurley knows them, of course—they’re Artspace residents who just finished up an exhibition at the Fitton Center. Built in 1993, the Fitton Center has expanded and been renovated, and hosts the gamut of the arts, with a bevy of classes (yoga, ceramics, guitar, you name it) for all ages, as well as live theater and jazz, art exhibitions in multiple gallery spaces, and summer camps. Landing that Artspace loft development was a major boon for the city. In 1979, Minneapolis-St. Paul was facing the sticky part of the artists-in-cities cycle: What happens when rising prices push them out of the very areas they helped to bring life to? The nonprofit Artspace was founded in response, taking a new approach to the old issue by turning a vacant warehouse in St. Paul’s Lowertown neighborhood into a 52-unit apartment building where artists (there, too, the term was defined broadly) could live and work at a rate they could afford. It opened in 1990. The rationale, in the organization’s words, was that “rather than seeing artists as barriers to economic growth, we recognized unique partners in building better communities: individuals low in income but rich in creativity, entrepreneurialism, and resilience.” The first floor was filled with commercial space for a coffee shop, gallery, studios, and offices. In the years since, that area—and its art community—has thrived. Fast forward a few decades, and Artspace has constructed some $491 million of similar developments across the country—properties that it works closely with individual communities to create, and that it continues to own and operate to ensure rents stay affordable. It didn’t take long for the 42 units in the Artspace Hamilton Lofts to reach full occupancy. That’s despite a fairly extensive application process for potential residents, including facing an artist selection committee on top of a background check and third-party review. Some of the earliest residents, Amber Bay and Lance Miller, moved to Hamilton because of the lofts. A stained glass artist and interior designer, Bay dreamed of a live up top, work down below situation, while Miller, a graphic designer and illustrator specializing in playing cards and board games, had always wanted to live in a community full of artists, à la Greenwich Village of lore. The Artspace setup has more than met their expectations. Hamilton City Manager Joshua Smith is well aware of the assets he’s working with: “We certainly strategically understand that what makes us different in Butler County, versus the other entities, is we are historic and architecturally significant and authentic,” he says. “It’s about placemaking, and art is such an important component of that. Anything we can [do] to create that place that people want to be is something that we need to embrace.” Businesses want to locate where there are people, restaurants, and activity. Since business attraction and retention is a big part of Smith’s job, he’s given this some thought. “We need to create a community, neighborhood by neighborhood, that encourages people to be out using the city in its fullest form,” he says. It seems so far to be paying off: a new Barclaycard call center created 1,500 jobs in Hamilton last year, and an $85 million Champion Sports Complex is in the works right across the river from Marcum Park. “It’s becoming a very livable city. The pieces are coming together one by one,” says MacKenzie-Thurley. Both he and Bud Scharf, the community development director, speak highly of cooperation between the city, residents, and businesses—not nightmares of red tape—and attribute the pace of these changes to that goodwill. When someone comes to the city with a question or idea, “we’re going to try to get to yes,” says Scharf. Which is another thing: They’re actually getting stuff done relatively quickly. In September, the City of Hamilton received a yearlong Creative Placemaking Immersion Program grant. This allows it to learn from others around the country and increase the activity at home, but it also launches the city into a bigger league: it will be on the radar of the National Endowment for the Arts. Hamilton is also the only city participating, as opposed to a nonprofit or visitors bureau. The Arts Strategy team Scharf facilitates, which started as a group of six, can now barely fit in a conference room. And the residents who have joined the arts team have become much more engaged in other aspects of life in Hamilton as well. This momentum has not happened in a vacuum; nationally, there’s been movement back into cities for years now. But many urban centers—especially in smaller cities like Covington and Hamilton—were thoroughly disregarded for decades. This newfound desire to live in cities has not magically created livable, much less vibrant, urban districts. Substantial work, time, and money have been dedicated, mostly unseen and in the supremely unglamorous purview of planners and bureaucrats. It takes market studies, the philanthropic support of foundations, getting the existing community on board, working out complicated financing that almost always requires tax credits and incentives, plans and plan revisions, and on and on. In other words, perseverance and optimism are required. It took about eight years for the Artspace Hamilton Lofts to become a reality, which is a fairly standard timeline in this realm. That means there’s going to be turnover in local government and business leadership, all of which threatens to send any plan to the back burner or the trash heap. Which is why it’s so impressive that Covington and Hamilton have persisted. 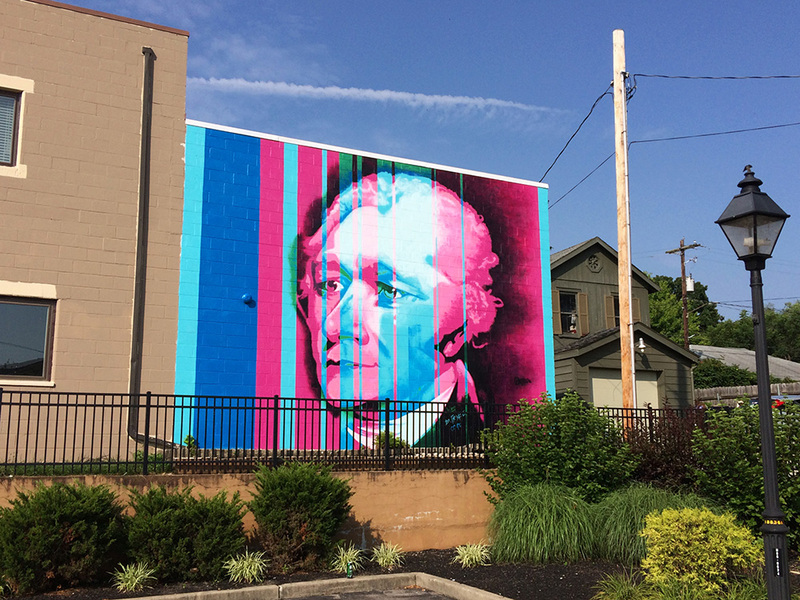 In other pockets of the Cincinnati region, art is integral to neighborhood identity and development as well. Wave Pool art center is building a scene in Camp Washington; Brighton has had one on-and-off for some time; Northside has been pinned as the artsy, offbeat neighborhood for years now, with home prices jumping in the past year or two. What sets Covington and Hamilton apart is the thoughtful, strategic manner in which this path toward development is being pursued—and particularly in Hamilton’s case, that the impetus comes from the city government itself. Previous articleAre The 2017 Reds For Real?